Air India's latest induction into its fleet is the stuff dreams are made of – the Boeing 787 Dreamliner which redefines passenger experience, environmental performance, lower operating cost and better economic performance.With its sophisticated, futuristic design, Air India's B787 Dreamliner is the most advanced aircraft in the sky. Its wing, tail, nose and flight deck windows have all been engineered for the maximum aerodynamic efficiency reducing fuel burn. The composite fuselage and smooth wing design is much more efficient than today’s airplanes. The substantial breakthrough in its fuel consumption and maintenance cost would help airlines save money while providing flexibility to expand into new markets. The Dreamliner's spacious architecture, stowage space, cleaner, healthier air, lower cabin altitude, dimmable-windows ensure a smoother and unrivalled passenger experience. 1. Candidate holding approval on A330/A320 family aircraft and their associated engines on SILK AIR \QATAR AIR \ETIHAD AIR \ KUWAIT AIRWAYS \ SINGAPORE AIRLINES are preferred. 2. 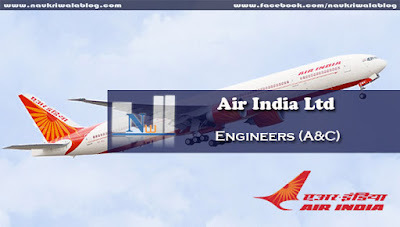 Current license (A&C) on combination of A330/A320 family aircraft fitted with CFM-56 5B / IAE V2500 Al/A5 enquires and or A330 Aircraft with its associated engines. 3. They should have undergone refresher course within the preceding 24 months. The candidates should have logged 6 months experience in the last two years, out of which 3 months must be in preceding 12 months. Fee : The application fee of Rs. 1,000/- should be paid into the AIESl Account No. 33029526378 of state bank of India Sansad marg Delhi. Interested candidates are required for walk-in in person to the venue on the dates and time given along with the application form duly filled in and requisite fee and documents. The recent passport size photographs and 2 stamp size photographs with white background to be provided with application form. Self-attested copied of Educational qualification, copies of aircraft license and approvals. During interview should be in possession of originals documents. Venue : Office of Central Manager (Engg), AIESL Hangar, Shamshabad Air Port, Hyderabad. Important Date: Walk-in-interview will be held on 24/08/2015 at 0900 to 1200 Hrs.